Most people think of pumpkins as only decorative items around this time of year. You pick out a huge one, maybe carve it into a Jack-O-Lantern, let it sit on the front stoop for a bit, and when it gets mushy, into the trash it goes. A month or two later when it's time for pumpkin pie, what do we do? Reach for a can. That's sad, because it's surprisingly easy to make your own pumpkin puree and stash it away in the freezer for the holidays. It's also relatively cheap. I've done it for the last few years running and believe me, once you've had pumpkin pie made with fresh pumpkin, it's difficult to go back. 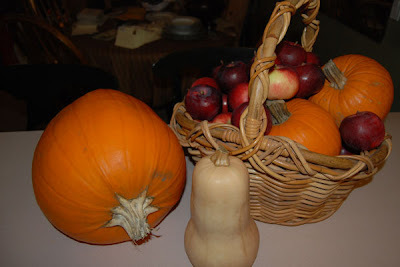 When buying a pumpkin for cooking, locate a smaller "sugar pumpkin" instead of the big Jack-)-Lantern ones. Usually, they're about the size of a cantaloupe. While all pumpkins are technically edible, the smaller varieties are bred to be sweeter, have thicker walls, and tend to be less stringy. 1) Pop the stem off the pumpkin. Using a large knife, split it in half from top to bottom and use a large spoon to scoop out the seeds and as much of the stringy part as you can. 2) Place pumpkin halves cut-side down on a large sheet pan that has been lined with parchment or lightly oiled aluminum foil. 3) Bake pumpkins at 350 degrees until a butter knife easily slides through the flesh. 4) Remove from oven and let cool so that you can touch and work with them. 5) If you have a food mill or ricer, cut the pumpkin into chunks and pass it, skin and all through the food mill. The food mill should separate the skin from the flesh. If you don't have a food mill, scoop the flesh out of the skin or peel the skin off (whichever is easier). Puree the pumpkin with a food processor or an immersion blender. The idea here is to break-up any remaining fibers, which aren't very tasty in the custard for your pumpkin pie. 6) Measure 15 ounces of pumpkin by weight or about 2 cups by volume into individual zip-top bags that have already been labeled with a permanent marker. This portion equals one can and can be substituted as such in most recipes. 7) Freeze the zip-top bags in the bottom or back of your freezer. To use, remove and thaw. Add to recipe as you normally would. Note: Fresh pureed pumpkin typically is much more moist than canned pumpkin. This won't make a big difference in something like pumpkin bread, but will make a difference in how firmly a pie sets. If you prefer a firmer set, either strain some of the liquid out with a fine-mesh strainer lined with paper towels before bagging your pumpkin or add an extra egg to the pie recipe.